If you are a Moodle user, and have investigated possible video-conference (VC) or webinar options to compliment the main Moodle functionality, then you can’t help but stumble across Big Blue Button (BBB) at some point early on. Operating out of Canada, the Big Blue Button team have been developing and refining this amazing free and open source VC solution for more than 10 years. And yes, that’s free and open source, even though the features rival those of commercial systems costing many thousands of dollars a year. 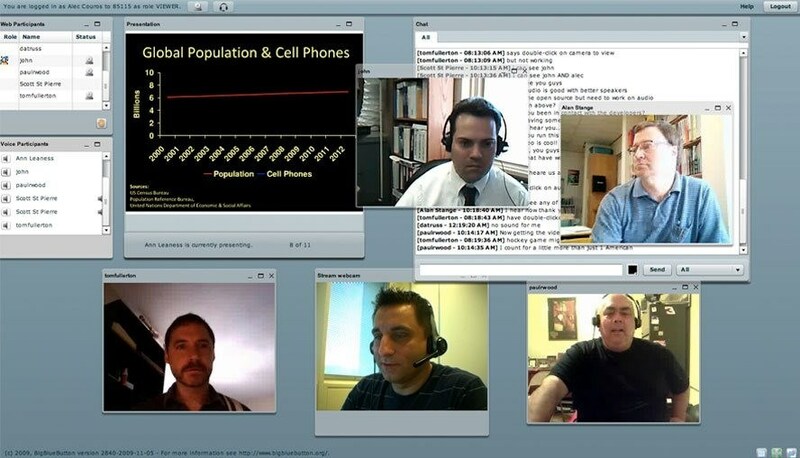 Big Blue Button is a web conferencing system designed from the ground up for online learning. Given this, it’s unsurprising that there is a an activity plugin for Moodle that can integrate BBB so it appears as ‘just another activity’ within courses, including calendar scheduling and completion tracking etc. Professional level features include real-time sharing of audio, video, slides, chat, and screen sharing. Students are further engaged through sharing of emoji icons, polling, and breakout rooms. Big Blue Button does need to run on it’s own dedicated server for best results, even so it’s easy to connect to a Moodle site (or indeed many other LMS’s), and extends the function of Moodle to include full web conferencing. It’s free open source, reliable and well featured, and it works seamlessly with Moodle … three great reasons to investigate further ! I like BBB and Zoom, used to use WizIQ, but preferring these now.